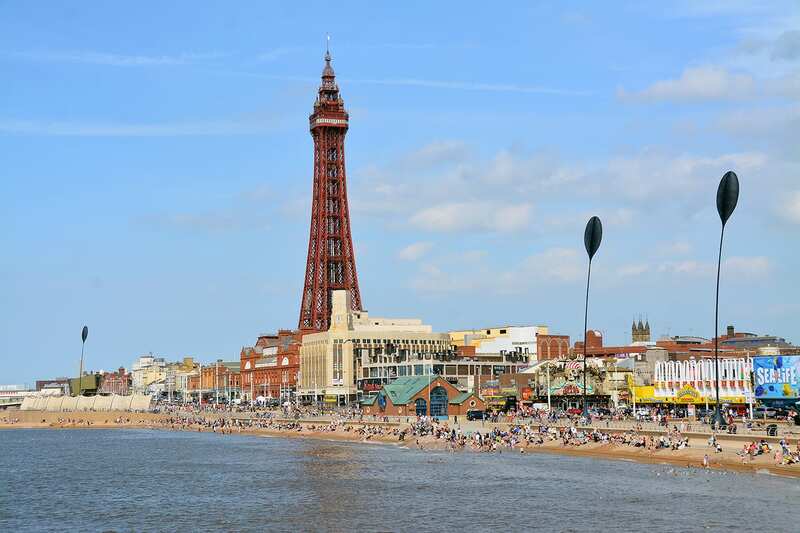 Have a look around Blackpool seafront with the pages in this section. We’ve split it up into sections with individual pages about each part. Live Blackpool has covered it all for you with lots of photographs, video clips and more information. We’ll start with two clips of the bit of Blackpool seafront which everyone knows best – the Golden Mile between the piers. These clips are taken from Central Pier. 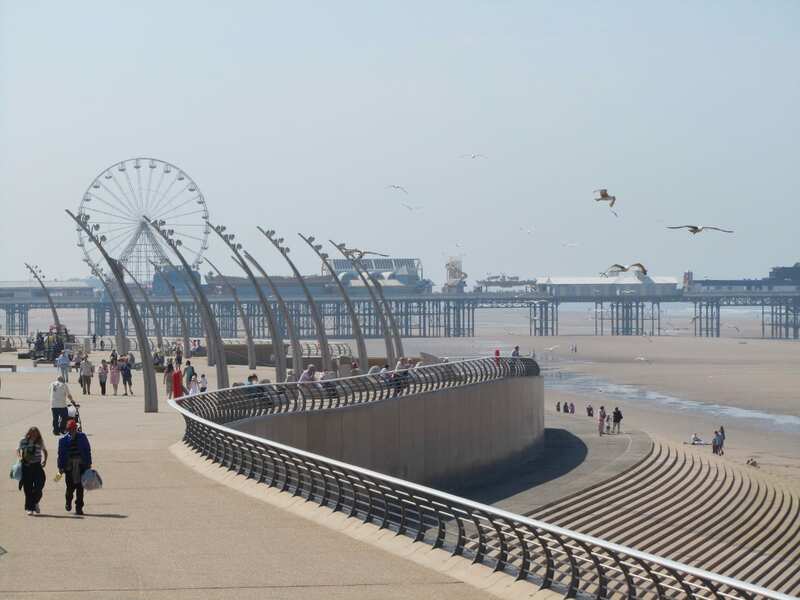 This one looks north towards central promenade and beach, with Blackpool Tower and North Pier. 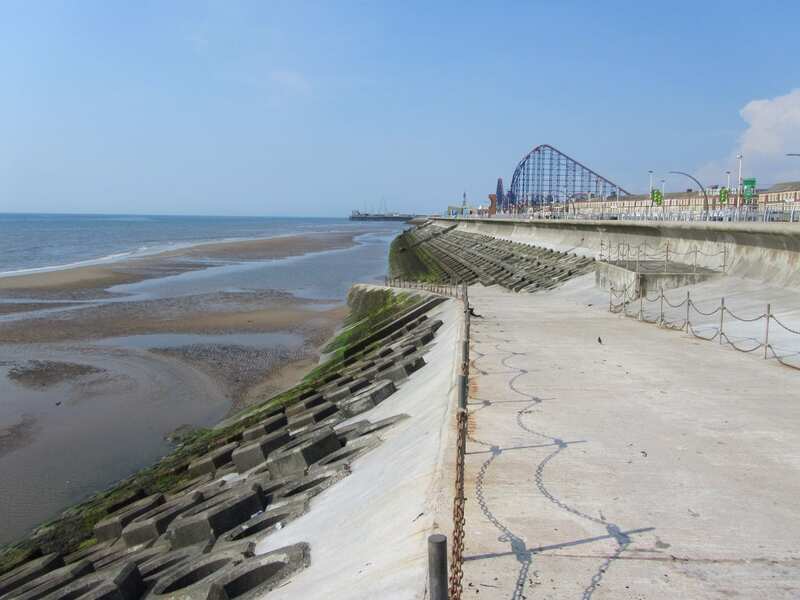 This clip looks southwards to South Pier and the Pleasure Beach. 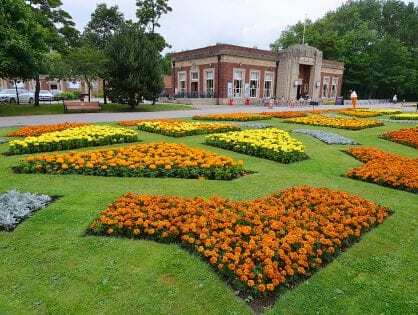 Now put your feet up and enjoy this drone footage with thanks to VJ Decoder – it flys over much of Blackpool seafront – plus some bonus shots including Stanley Park and such like. Blackpool by drone from vj decoder on Vimeo. 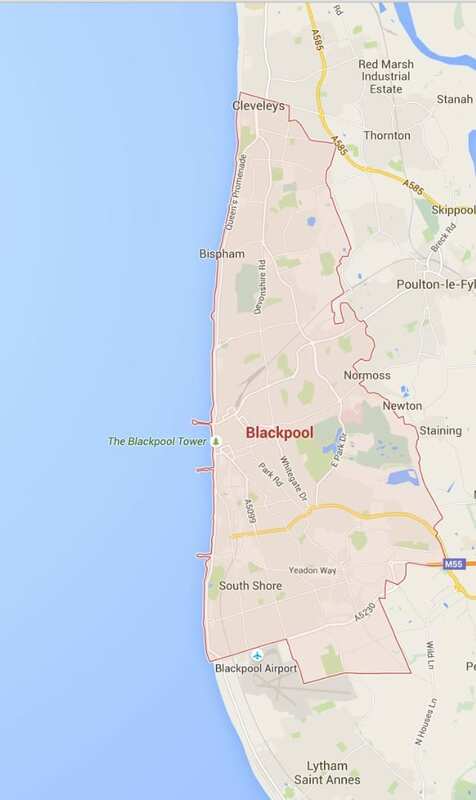 In the south, Blackpool starts at Squires Gate, where the sea defences are relatively new. The concrete sea wall includes ‘sea bees’ – they’re hexagonal concrete shapes that disperse the energy of the waves. Wildlife have taken them over after years of being submerged in water. Seaweed and marine life now grow on their surface and in the pockets of water left with each outgoing tide. Here, the wide and reasonably new promenade opposite the Solaris Centre includes pieces of public art. You’ll see the iconic Glitterball which was completely refurbished in recent times, so that it carries on twinkling for many years to come. Around South Pier, opposite the Pleasure Beach and Sandcastle Waterpark, Blackpool’s most recent sea defences begin. The new design includes wide, extended headlands which stretch out into the sea. Spanish steps go down to the beach along the length of the curved design. 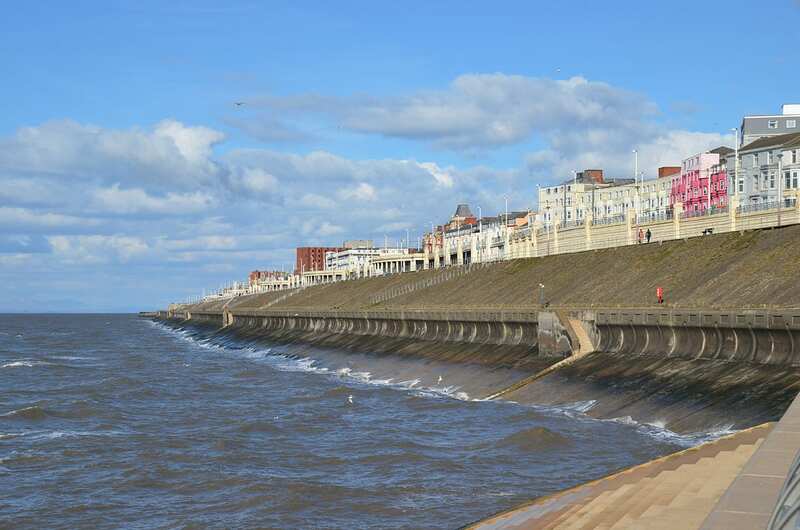 In central Blackpool along the Golden Mile and between the piers, the Spanish Steps are interspaced with sections of concrete wall. Miles of golden sandy beach are yours to enjoy in winter or summer. 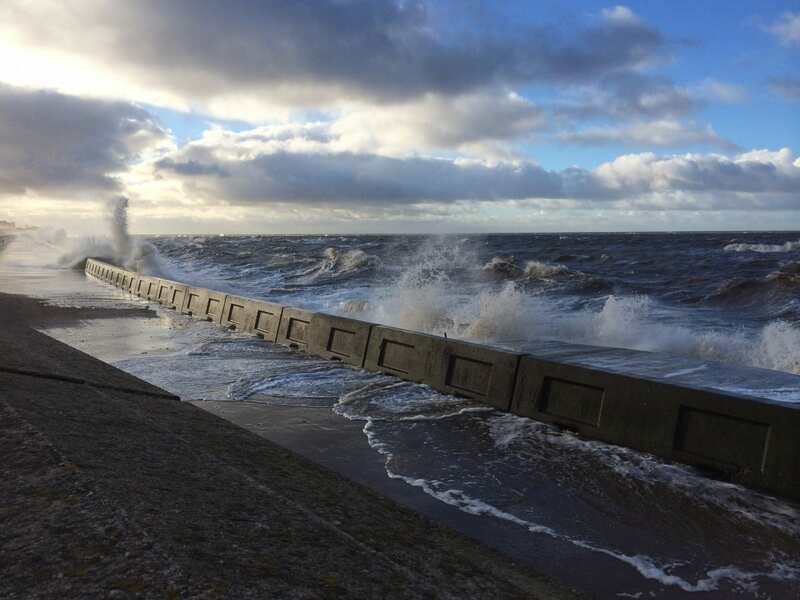 Whatever the weather you can enjoy the promenade walkway right against the sea. At Tower Festival Headland you can stop to read the Comedy Carpet, sit on a seat to soak up the atmosphere and enjoy the views. Although it’s a man-made wall, the beach is still a rich table for the birds that feed there. 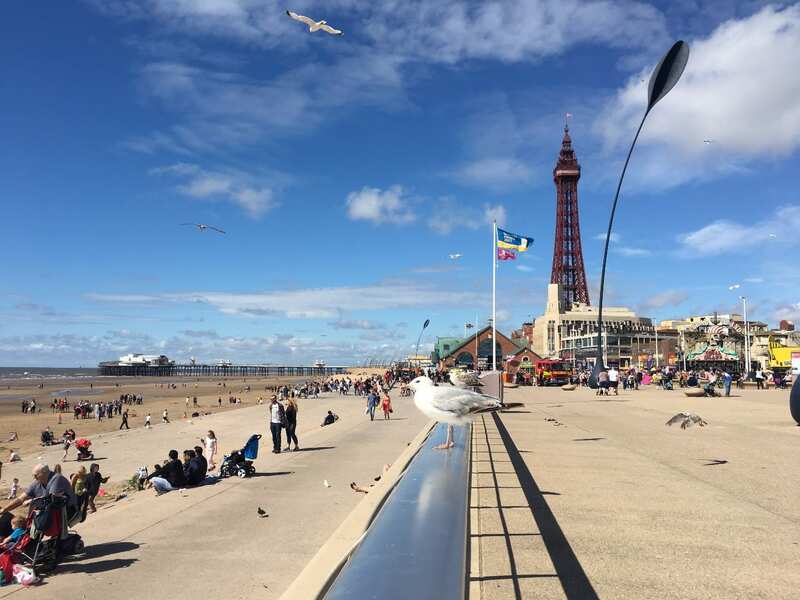 Blackpool wouldn’t be Blackpool without the resident seagulls. Keep your eyes open and you’ll see lots of wildlife along the whole of the Fylde Coast. Head past North Pier to Bispham and the seafront changes quite dramatically, rising to the tall grassy banks and cliffs. The only high spot on this coastline, it’s a place to enjoy fabulous views over the shore. To your left you’ll see North Pier and to the right Bispham and Cleveleys. Over the water, still looking to the right, are the Lakes and out to sea the offshore windfarms. Before leaving Blackpool in the north, you reach Anchorsholme as you approach Cleveleys, and the last section of promenade is Princes Way. 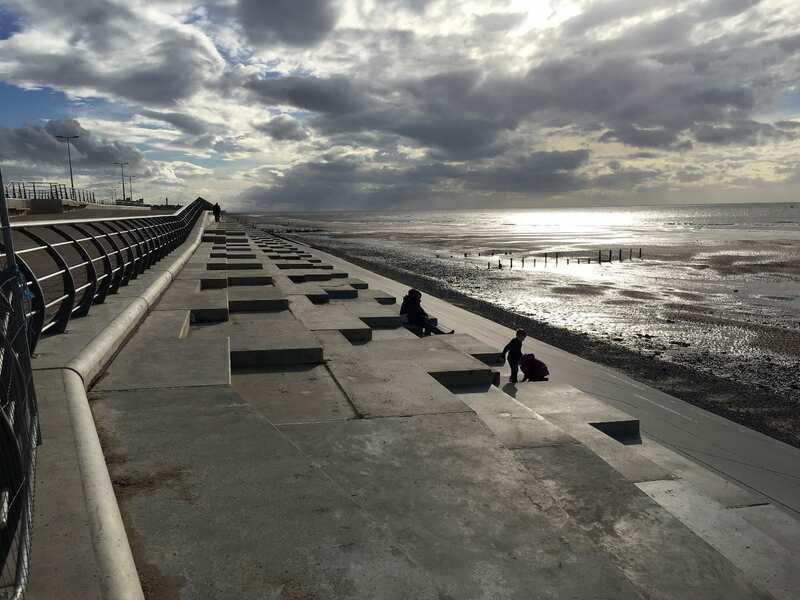 Anchorsholme sea defences is the very last section of Blackpool seafront as you approach Cleveleys. It was rebuilt in a project costing £22m and completed at the end of 2016. 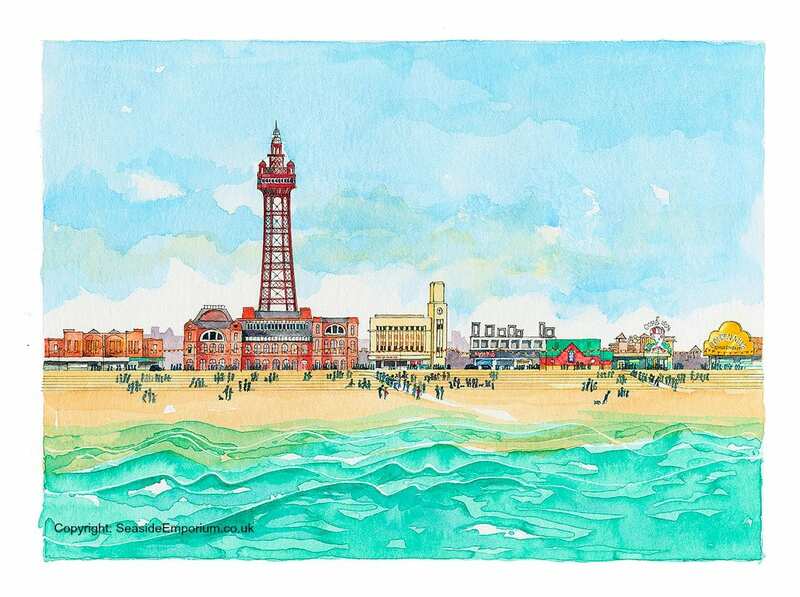 This is our original watercolour painting of Blackpool Seafront – it’s available in various sizes as a framed, mounted or plain print. 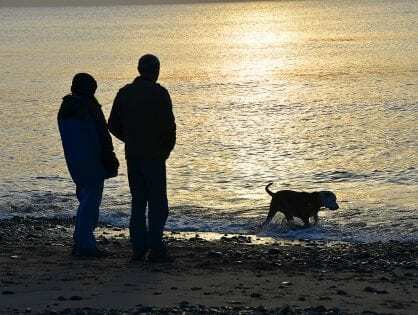 Have a look around at both local scenes and traditional seaside views.